Recently updated packaging has seen Deep River keep their traditional logo, while also retaining their star-burst color contrast and the graphic kettle and sliced potato. What they have changed is the main bag color - each different flavor has a bold and striking color packet which will stand out on the shelves. 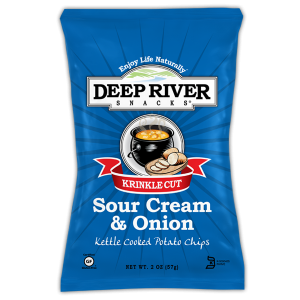 While the dark blue bag coloring bares little association with the Sour Cream & Onion flavor within (the green bags had gone), it does stand out and as the flavor is their first Krinkle Cut Chip, it should. Oddly, the aged Kettle and Potato graphic works well with the red banner. Deep River Snacks just got even crunchier. While you can often grab a handful of Chips and munch away merrily. Eating these Ridged Chips was like eating a meal - one at a time. They were hard, firm, but still crispy; a great combo in the crunch stakes. Deep River Snacks Chips are all thick and strong. These managed to be thick, strong and deep ridged. There were some crumbs at the bottom of the bag, but it looked too difficult for any to break in half! The powdery residue stuck firmly but flakily to the Chips and a few familiarly curled examples would show Pringles a thing or two about what a real Potato Chip could look like. Using the 'If you can't beat them, join them' philosophy, but with a good old Deep River Snacks twist, this is what Jim Goldberg, Deep River Snacks Founder and CEO, said when he launched this Marcelled variety of Chip in January 2013: “We know that Sour Cream & Onion is a popular flavor with other chip companies, but we wouldn’t launch this flavor until we were certain that our Sour Cream & Onion Chip would stand apart from the competition.” The different cut of the Chip was a good idea and the flavor stands up against most. There is a creamy cheese flavor. The balance is fine and while there is nothing amazing about them, they are a great addition to their range.